This is Photobus by Daniel Meadows, homepage of the Free Photographic Omnibus and Digital Stories. Photobus is a journey in photo documentary. It began in the 1970s with still photographs and continues into the present, a time when pictures have discovered the talkies. mentary practice. His photographs and audio recordings, made over forty-five years, capture the life of England's ‘great ordinary’. Challenging the status quo by working collaboratively, he has fashioned from his many encounters a nation's story both magical and familiar. This book includes important work from Meadows’ ground-breaking projects, drawing on the archives now held at the Bodleian Library. Fiercely independent, Meadows devised many of his creative processes: he ran a free portrait studio in Manchester's Moss Side in 1972, then travelled 10,000 miles making a national portrait from his converted double-decker the Free Photographic Omnibus, a project he revisited a quarter of a century later. At the turn of the millennium he adopted new ‘kitchen table’ technologies to make digital stories: ‘multimedia sonnets from the people’, as he called them. He sometimes returned to those he had photographed, listening for how things were and how they had changed. Through their unique voices he finds a moving and insightful commentary on life in Britain. Then and now. Now and then. Daniel Meadows’ photographs have been exhibited widely with solo shows at the Institute of Contemporary Arts London (1975), Camerawork Gallery (1978), the Photographers' Gallery (1987) and a touring retrospective from the National Science and Media Museum (2011). Group shows include Tate Britain (2007) and Hayward Gallery Touring (2008). Boot-boys are 'Big Picture' in the Observer. 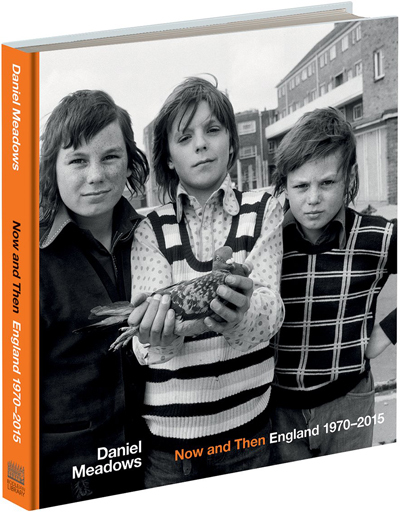 Daniel Meadows in new exhibition at The Hepworth, Wakefield, opening 13 July. Daniel Meadows and Niall McDiarmid, walk-and-talk at the Martin Parr Foundation. r/t: 2 min, 23 sec. In the UK when we ask: "Where are you from?" we want to know a lot more about you than just your place of birth. This story is about the England I come from. Book. 1973. City Close-up. Wonderful English oral history done in Blackburn, Lancashire. The book by which all other books of oral history must be measured.